Despite Gov. 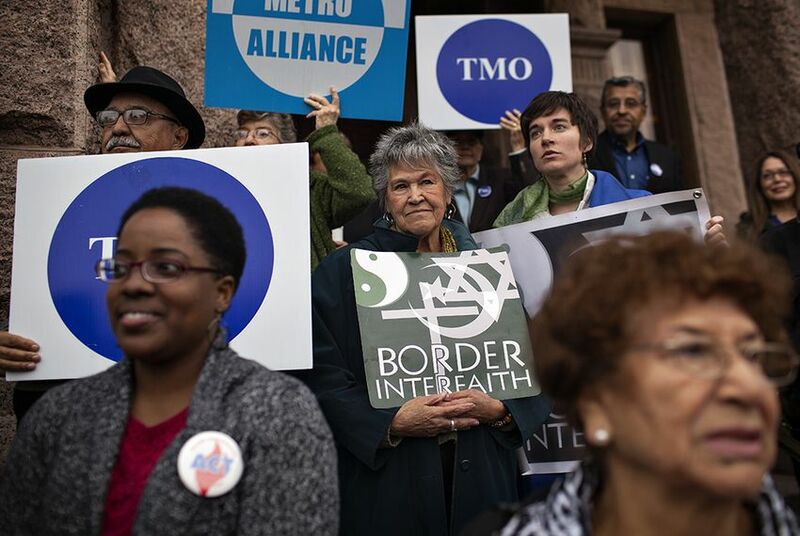 Rick Perry's unwavering position, interfaith groups and Democratic state legislators rallied on the Capitol steps on Wednesday in support of expanding Medicaid to impoverished adults, as directed by federal health reform. Interfaith groups and Democratic state legislators rallied on the Capitol steps Wednesday in support of expanding Medicaid to impoverished adults, as directed by federal health reform. "We don't want more mothers dying. We don't want to lose more brothers," said Rosalie Tristan, a leader of Valley Interfaith. "We want you to do something. We don't want you to do nothing." Gov. Rick Perry has repeatedly said Texas will not expand Medicaid when the federal mandate to purchase health insurance begins in 2014. Many Texas Republicans have argued that Medicaid expansion would overburden the state budget, endanger access to care for patients currently enrolled in the program and put the state on a path to socialized medicine. "It would be irresponsible to add more Texans and dump more taxpayer dollars into an unsustainable system that is broken and already consumes a quarter of our budget," Perry spokesman Lucy Nashed wrote in an email to the Tribune. "Gov. Perry continues to call for flexibility in the Medicaid system so we can implement programs that are in the best interest of Texans, but the Obama Administration has made clear they are unwilling to provide the states with the flexibility we have been asking for." "The numbers are solid. This is economic development and social justice," said state Sen. Leticia Van de Putte, D-San Antonio, one of more than a dozen Democrat state legislators to speak in favor of Medicaid expansion at the rally. "This is health care that makes sense. Let's put politics aside and do what's right for the people of this state." State Rep. Lon Burnam, D-Fort Worth, said he believes the state can develop a bipartisan effort to expand Medicaid. In Arizona, for example, Republican Gov. Jan Brewer plans to approve Medicaid expansion on the condition that the state immediately pull the plug on the program if the federal government reduces its financial share, he said. "There are people on both sides of the aisle who are too smart to lose billions and billions of dollars," Burnam told the crowd. For some Texans, like Regina Gunter of the Allied Communities of Tarrant, the Medicaid expansion would mean a vast quality of life improvement. Gunter used to be on Medicaid to receive treatment for schizoaffective disorder, but a new job raised her income above the eligibility ceiling. The expansion would make Medicaid available to people with broader income levels, she said. The interfaith groups that led the rally have also supported a series of county resolutions in favor of Medicaid expansion. So far, they have worked with judges to pass resolutions in Travis and Dallas counties.